The community of Fish Camp, just two miles from the Yosemite National Park boundary, is home to charming bed-and-breakfast inns, cabin rentals, and a magnificent world class hotel, Tenaya Lodge at Yosemite. Highway 41 approaching Fish Camp passes through Sierra National Forest, with many side roads leading to hiking and equestrian trails, and the always popular Yosemite Sugar Pine Railroad, an authentic, steam powered trip into the past — and into some impressive mountain scenery. 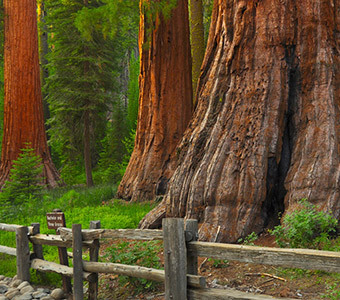 Just inside the park’s south entrance, the Mariposa Grove of over 500 giant Sequoia trees greets visitors with some of the most magnificent, oldest and largest living things in the world. Venturing on to Wawona, there is the classic Victorian style Wawona Hotel, the Pioneer History center where Yosemite’s recent past comes alive, and the Wawona golf course. The South Fork of the Merced (crossed by a historic covered bridge) flows gently through Wawona, a lovely place to camp, meditate, or swim. The Wawona Road continues on to Yosemite Valley, passing through Yosemite West, where a number of privately owned mountain homes and condos are offered as vacation rentals. At Chinquappin the Glacier Point Road leads to the Badger Pass ski area in winter, and to Glacier Point in summer. Descending to Tunnel View, the road offers a spectacular panorama of Yosemite Valley, with landmarks from Bridalveil Falls to Half Dome to El Capitan revealed before you.